Some students of the Bible have referred to the parable of the Prodigal Son as evangelium in evangelio, "the Gospel in the Gospel." In other words, the message of the the Gospels, the good news of Jesus Christ is encapsulated in this parable. 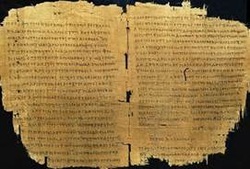 Another connection between the parable and the Gospels is how many of the narratives in the Gospels parallel the narrative of the parable. Check out one or more of the parallels suggested below. Look for the parallels to the parable of the Prodigal Son in the following Gospel stories. 1) Read the passage, considering parallels to the parable. 2) Jot down similarities (and differences) that you notice. 3) Try rewriting the passage in the light of the parable of the Prodigal Son. 4) Finally, click on the corresponding link below to see another attempt at reading the stories intertextually.